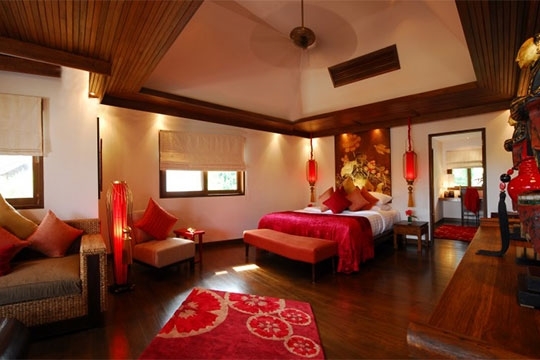 Baan Lotus feels like a home. 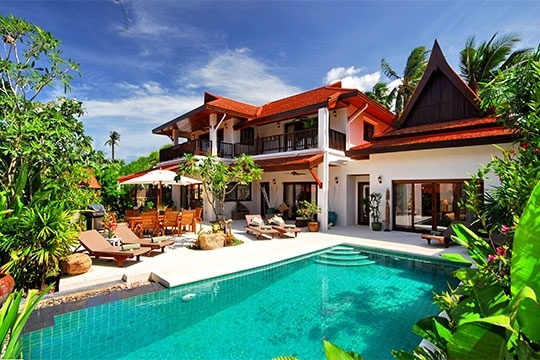 Set on a quiet avenue within the gated Shiva Samui Resort development, surrounded by similar houses, the area reminds you of a well-heeled suburban neighbourhood, with the added advantage of a secluded tropical beach close by. The house itself is spacious and airy with plenty of places to kick back and relax. The air conditioned living room is comfortably furnished and boasts a TV, DVD and even a Play Station 3 (on request) for those who prefer cooler, indoor holiday diversions. Outside, the blue-tiled swimming pool and stone-washed sun terrace allow you to make the most of the sunshine, and with the soft sands just a couple of minutes' walk away, you don't have to travel far to relax and enjoy the island's charms. The terrace is also great for barbecues, although with a well equipped, open kitchen and comfortable dining space, preparing more elaborate meals may also appeal – especially if you decide to hire a personal chef to do the work. The rate includes a full buffet breakfast at the clubhouse restaurant and the well-managed range of services at Shiva Samui Resort allows you to choose anything from total self-sufficiency through to room service meals or a more pampered experience complete with private chef and home massage treatments. Housekeepers visit twice a day and there's a guest relations manager on call to deal with special requests. For families, the convenience of a walled, private environment removes the stress of monitoring the kids or competing for sunbed space. Although the surroundings are less exclusive than at some of the more opulent, stand-alone villas on Samui, Baan Lotus offers plenty of personal indulgences without stretching the budget to its limits. As it's quite a distance to Samui's main beaches and tourist centres, the house will appeal more as a private getaway than a base for dining, shopping and nightlife. Daytime excursions are easily arranged, however, and many of the island's natural attractions are within easy reach. Those who don’t want to wander too far, can make use of the village’s many facilities, such as fitness centre, spa, restaurant, kids’ club and fitness centre, as well as bicycles and kayaks for hire. Attractive family holiday home with secluded pool and sun terrace and great shared facilities. Baan Lotus is part of the Shiva Samui Resort development, a collection of attractive, contemporary residential properties that line three small lanes leading down to Natien Beach, one of the island's less visited stretches of sand. Although incredibly picturesque, low tides can make swimming difficult from April through to August. There's a long-established Thai resort next door complete with its own on-site aquarium and mini-zoo, but this is a considerable distance from the house and only noticeable because of occasional bird calls during the day. In the windier months (March to June and October to December), a kite boarding school operates out of the same resort. Watching the kites and riders shoot past the beach adds an unusual element to the beautiful ocean views. Peace and quiet predominate in this part of the island although proximity to other houses means some noise from the neighbours is inevitable. Large, wooden gates open onto an inner courtyard, carport and pool terrace at this private estate residence. Sliding glass doors take you through to a spacious T-shaped living, dining and kitchen area. These areas – as well as all the bedrooms – have ceiling fans, air conditioning and polished wooden floorboards keeping things cool and airy. The well-equipped kitchen has every modern amenity and features a central breakfast island with black marble countertop and four stools, plus an antique, white wooden cabinet proudly showcasing a range of coloured glassware. In the dining area Thai artefacts are attractively displayed on wooden tables either side of a dark wood dining table (seats 8), while contemporary Thai artwork decorates the walls. The living area features co-ordinated blue accessories, including an attractive Vietnamese hanging lamp. The room is furnished with an L-shaped, upholstered rattan sofa and a low wooden coffee table which sits in front of the TV and DVD cabinet. Sliding doors from the living area open directly onto the pool deck, where two comfortable planters’ chairs add a luxurious touch. A 10m blue-tiled pool is surrounded by a sandstone terrace furnished with wooden sun-loungers, where high walls and tropical foliage ensure privacy from the neighbours. A second set of doors from the living area take you through to the downstairs master bedroom, with its vaulted ceiling, queen-size bed, spacious ensuite bathroom and Thai artwork creating a very comfortable space. Floor-to-ceiling glass doors open directly onto the pool terrace. 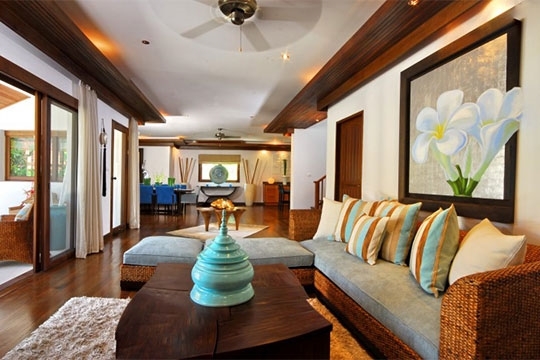 To the rear left of the master, a guest bedroom also features a queen-size bed and ensuite, with a small terrace overlooking a coconut grove. Wooden stairs lead up from the centre of the house to the first floor which houses two further bedrooms, ideal for a family with young children. On the right is a second master suite, decorated in reds and burgundies. This very spacious room has a king-size bed, seating area and private balcony, as well as a walk in dressing room and ensuite. On the left is a twin-bedded room also with private balcony, seating area, dressing room and ensuite (Note: none of the bathrooms have tubs; all have rain showers). The staircase then continues to a third level and a rooftop terrace furnished with sun loungers. 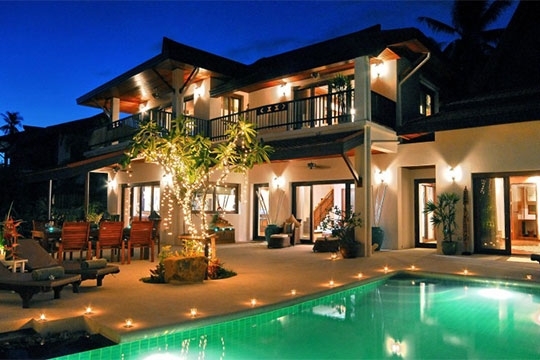 4 bedroom villa located in Laem Set, Koh Samui. Ideal for Body and soul, Bring the relatives, Kid friendly, Gastronomic delights, Fair share for groups, The great outdoors.